(first name rhymes with Denise because she likes to be difficult), is a Chicago based entrepreneur and comedian. When she's not slaving over an unnecessary spreadsheet or micromanaging others, she performs her unique brand of stand up across the Chicagoland area. Janice uses her experience as being the whitest Latina she knows and an at best average marriage partner to tell her side of the story. Janice aims to bring a fresh perspective to topics related to her culture, Indiana upbringing (Indiana+culture=oxymoron) and her professional and personal lives. She's also really tired. Janice regularly performs at Chicago area showcases and has performed at comedy clubs Zanies, Improv, The Drop (South Bend), Laugh Factory, Comedy Shrine and Jackie Knights (St. Augustine, FL). 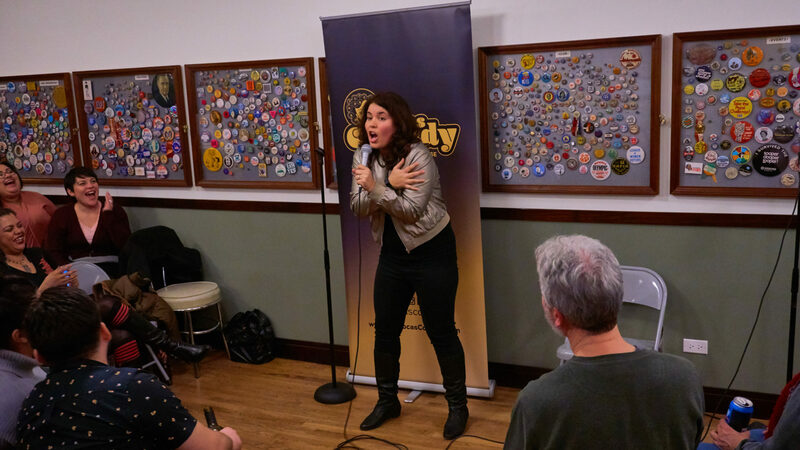 She has also been invited to several comedy festivals such as Chicago Women's Funny Festival, SheDot (Toronto), Lady Laughs (Madison) and LaughFest (Grand Rapids). Janice is a founder and producer of Las Locas Comedy, a comedy showcase that features Latina comedic talent and our favorite locas. Check out her performance calendar to see her at an upcoming show!